As the most common health-care intervention, prescription drug use shares the most important characteristics of the health-care system in the United States. When everything works well, it makes possible breathtakingly successful applications of science to the prevention and cure of human suffering. But everything doesn’t always work well. Pharmaceutical Public Policy provides the understanding and framework required for effective organization, financing, and delivery of pharmaceutical products and services. It supplies an overview of the policy process as well as the roles of legislation and regulation in pharmaceutical policy. The book identifies the goals, objectives, and key policy issues of concern to stakeholders involved in the development of products, use of pharmaceuticals in healthcare, and administration of insurance programs by both the private and government sectors. Policy issues examined include the appropriateness of prescribing and patient adherence. 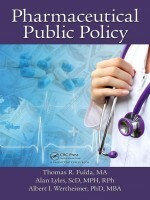 Addressing questions of access, quality, and cost, the book considers the operation of the Affordable Care Act and Medicare Part D. It details the responsibilities of Federal providers of pharmaceutical care and private and public payers such as managed care organizations, pharmacy benefit managers, Medicare, and Medicaid. The book covers the policies and practices involved in promoting pharmaceutical products. It also considers pharmacoeconomics as a response to market failure. Finally, the book describes the market, the role of the manufacturer, drug shortages, and the responsibilities of the FDA.